My cousin Andy and his fiancé Mark flew into Seattle from Montreal to visit. 🙂 Happy us. 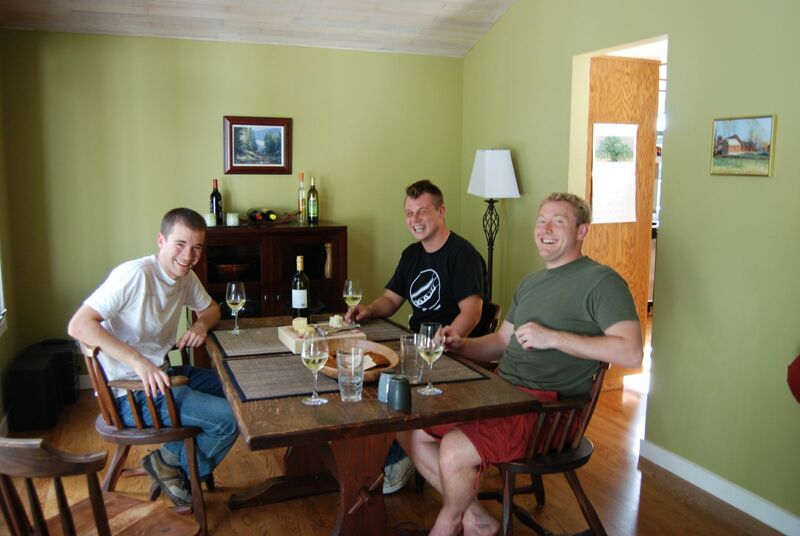 They spent the early part of the day in Woodinville tasting wine, and then came over midafternoon. Such a treat. They were the first family on my side after my parents to see our new house. We worked our way through several cheeses before a yummy dinner out on the patio of salmon and CSA squash on the grill, with a strawberry salad. Nine hours, and no pauses in the conversation. 🙂 This is the second photo I took – the first came out terribly because everyone was mid-sentence. What a happy surprise to see all of you together – a festive conclusion to birthday season at your house!